our Life in Spite of MS Newsletter. As always, we are pleased to be able to bring you special tips, recipes, and more that will help you in your everyday life and especially during the holiday season. Every issue is archived on the website if you'd like to read it again. Plus you are also welcome to share these archived issues with your friends if you think they would benefit from them. We're are glad to be able to bring this issue to you. We are at the end of another year. It seems that the months and years go by so quickly. So many things have happened in such a short amount of time. We told you last month about our daughter going overseas to teach in Saudi Arabia. We have gotten a little more used to the idea and we were able to talk to her on Thanksgiving. Everyone that came over for dinner that day got a chance to spend some time with her - so to speak. And if you haven't joined already, we encourage you to come hang out with us at The Link. It's the companion site - a network with a forum/message board. You can meet other visitors, share photos, music, and videos. You can also start a blog or a group. There are plenty of things to do, so join us. Here's the link to The Link : ) Once you get there, invite your friends and family as well. (Clicking the link will open a new window). Over 30 members and growing! And as we talked about last month, we have a children's and teens group. Whether your child or teen has MS or they are dealing with you having MS, they are welcome. You will need to help them sign in or they can sign in under your name. We're keeping this area a little more protected, so you can join by invitation only. This months newsletter turns the focus on managing your MS during the Holiday Season. Even though every month, week, and day of the year has it's challenges, the holidays can be doubly so. The idea is to have fun without wearing yourself out. This feature is back and we hope you enjoy the book we've chosen this month. It's only fitting that we include a few holiday recipes this month. I don't know if I could get through the season without cookies, brownies, and a cake or two. At least this year I know to give most of them away. That way I get the pleasure of baking them and also the pleasure of seeing someone else enjoy them. (And less of the guilt for eating them). I have learned to be a little more self-controlled as I get older, which is a good thing. One of the things I can always remember about the holidays when I was growing up, was there was no ban on sweets. We could eat as many cookies as we wanted, though I'm sure all the cookies weren't placed where we could get them. The table was laid out with fruits, nuts, and other good things and we could eat our fill. The discipline from the rest of the year caused us not to go hog wild on those few days of the year when were given free reign. I can't ever remember eating to the point of sickness. My brothers on the other hand, I'm not so sure, lol. This months recipes aren't exactly healthy. They do come from Swank and Dugan's Multiple Sclerosis Diet book, though. So hopefully they aren't too bad. The recipe's are made to be low in saturated fats. And anyway, it's only a couple days out of the year, so go ahead and splurge. The recipes in The Multiple Sclerosis Diet Book are based on 36 years of research by Dr. Roy Swank. He along with Barbara Dugan, came up with the diet and recipe suggestions in this book. The two cookie recipes are the ones I will be making this year for the holiday season. I'll let you know how they turn out! Preheat oven to 350 degrees, F. Beat eggs; gradually add sugar and oil, then orange juice and grated orange peel. Add to the egg mixture. Mix well. Drop by teaspoons onto nonstick cookie sheet and bake 8 minutes. When cookies are cool, ice with Orange Icing. Yields 2 dozen cookies. In a small saucepan heat, but do not boil, the orange juice, orange peel, and salt. Stir in enough powdered sugar to make consistency for easy spreading. Beat egg. Add sugars gradually, then oil, vanilla, and peanut butter. Combine flour, baking powder, baking soda, and salt. Stir into peanut butter mixture; stir until well blended. Form into balls about 1 inch in diameter. Place on nonstick cookie sheet about 2 inches apart. Press cookies flat with flour-coated tines of fork. Bake 10-12 minutes. Yields 4 dozen. Both recipes from The Multiple Sclerosis Diet Book. This insightful quote gets right to the true meaning of things. And it was said by a child...out of the mouths of babes! Oh well, what can I say? "Love is what's in the room with you at Christmas if you stop opening presents and listen". If you've always been the one to serve up the holiday season on a silver platter, you may need to think twice about doing it this year. Even if your symptoms are mild, it's probably a good idea to begin toning down the festivities. If you absolutely don't want to do that, consider learning to delegate more tasks. Or at least lessen the amount, by say, one-half. Focus on family and friends instead of things. 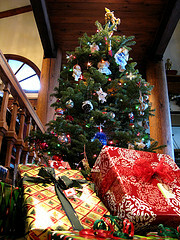 Many of us may need to reduce the number of gifts we give because of the economy anyway. Consider asking everyone to make a few of their gifts this year. That decision can also be costly depending on the gift, but most times it is a little less expensive. You may have holiday traditions that include cooking an elaborate meal. Why not make it a potluck day? If you have guests, consider having everyone make an entree, a side dish, and a dessert. Set up a buffet table, and there you have it. Dinner is served! Another alternative if you have the resources, is to cater your dinner. And still another would be to order those ready made meals. That way all you need to do is reheat everything. You can even say you cooked all day if it will make you happy. Throw on an apron, put a little flour on your nose, and no one will be the wiser. If your children are used to having 12 dozen cookies, consider getting the older ones to take over that task. Get everyone involved. If you don't have older kids, ask a cousin or aunt, uncle, or maybe even Grandmom (if she's still able), to fill in a bit. Traditions may be fun to continue, but be realistic about what you can and can't do. Realize your limits. If you know that doing the "traditional" thing will cause you to become fatigue, start a new tradition. One that's simpler and easier, and involves other people in the preparations. If cognitive problems have already started to surface, consider writing lists to help you stay organized. If you have a list, you may also be able to cross out the things that don't really need to be done. Lists can help you remember what still needs to happen. They can help if you have someone coming to give you a hand. Simply hand them the list, and realize they won't do everything exactly the way you would, but that's okay. That brings us to our last tip. You may have to lower your expectations - especially if you are a perfectionist. Many times we want things done our way and no one else has a say. If your used to running all around buying gifts, cooking, baking, and wrapping presents, rethink the whole season. Does it really have to be like this? Lowering your expectations, doesn't mean a time with any less quality. As I said earlier, begin making new traditions. Ones that you will be able to do for many years to come, in spite of any disability. Hope this months tips were helpful. Our wish is that you have a warm and wonderful holiday season. May those wishes extend all the way into next year and beyond. (Clicking image below will open a new window). 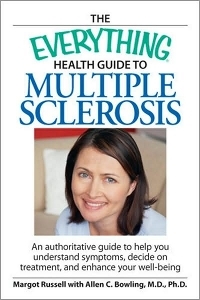 This months book The Everything Healthy Guide to Multiple Sclerosis by Margot Russell with Allen C, Bowling, MD., PhD is one of those books you will probably turn to over and over. It is described as "An authoritative guide to help you understand symptoms, decide on treatment, and enhance your well-being". The rest of the chapters deal with employment, family life, the future of MS, support, advanced MS and the caregivers role. There's not much it doesn't cover. I especially love the highlighted tips, alerts, and facts, throughout each chapter. You can flip through the pages depending on how much time you have to read and still find useful information. The book also has an appendix with additional resources and a glossary as well. Talk about a great resource, this is sure to be one that you turn to over and over. I'd suggest getting your own copy of The Everything Healthy Guide to MS.
We had our first snow today! Thank goodness it was just a light dusting, but it was really really cold. That only brings to mind the inevitable fact that winter is coming. And with it, more snow and ice. With that, there is the potential of falling accidents. While this is not a laughing matter, I think you will enjoy the reference to this time of year. You can still check here for past Cartoon of the Month cartoons. 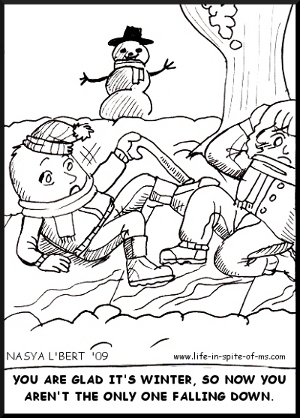 This months cartoon is drawn by my 16 yr old daughter, Nasya. She is an up and coming young cartoon artist. Enjoy her artwork - (she may be famous soon). Here is the cartoon. We hope you enjoy it.